Home Venta Water Treatment Additive 35 oz. This Bottle contains 35 fl. oz. of Venta Water Treatment additive which is designed to maintain hygienic conditions in the lower housing and to improve the evaporation process. The use of Venta Water treatment additive is recommended for the best performance and effidiency of your Venta-airwasher.This product can be used for all Venta Air Washer Products. Add a dose (approximately 3.5oz.) to water about every 10 - 14 days to kill bacteria in water and purify the air. Improves Airwasher Performance. Use every 10 to 14 days, Helps prevent mineral deposits. 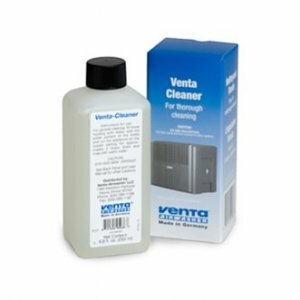 Notify me of updates to Venta Water Treatment Additive 35 oz.